Pooja Rani of R.S.Model Senior Secondary School here has secured first position in the district and third position in state in class XII, Punjab School Education Board, the results of which were declared today. Though the meritorious students could not get their total marks or percentage but they were on cloud nine when they came to know about their respective positions in the state and district. Talking to Ludhiana Tribune, Pooja Rani, who was first in the district, said that she got a call from her school about the results. A student of Arts, Pooja has scored 454 marks out of total 500 in class XII. She owes her success to the Almighty, teachers and encouraging parents. She said, “I want to become a professor in maths. I believe in self-study. I used to study for at least 4-5 hours in a day. Economics and Sanskrit were my other subjects. Though these are scoring subjects but one has to be determined and hardworking to get good marks,” said Pooja. She belongs to a middle-class family; Pooja’s father runs a kiryana shop here. She said that her parents had always boosted her to score well. Two more students, Lovish Pabbi and Shailja Goel, of the same school have secured eighth and 10th positions in the state, respectively. A non-medical student, Lovish Pabbi got 445 marks out of 500. He said that he never took any tuition. “If one pays attention in class, there is no need to attend extra classes. But one has to study religiously to score well,” he said. Shailja Goel scored 443 marks. Manjeet Kaur of Shakti Punjab Senior Secondary School, Macchiwara, came 11th in the state by scoring 442 marks. The position was also shared by Devinder of Guru Nanak Model Senior Secondary School, Doraha. Four students of Ludhiana district were able to secure 13th rank in state by scoring 440 marks (each). Ranks 14th and 15th were also bagged by students of Ludhiana. The happiness could be seen on the faces of the meritorious students, who said that they were eagerly waiting for the detail marks. Shruti Sharma, who got 15th rank in state said, “We hope to get the clear picture by tomorrow. It is time to build new dreams and turn them into reality”. The municipal corporation authorities today ordered the draining of polluted water from the forest area on the Ludhiana-Jalandhar road that was threatening a number of trees. Joint commissioner B.K. Gupta today directed his staff to drain out the sewerage water from the area after the matter was reported in these columns today. He said they would find out the source of polluted water and seal the leaking point if it was a sewer line. He said the water would be drained out by tomorrow. Gupta said this during a sangat darshan programme organised in the MC office in the Mata Rani chowk to redress the grievances of zone A residents. The Tribune had reported that many trees were on the verge of being dead as polluted water was being discharged into the area. Many trees had already died and many were meeting a similar fate. The problem was assuming alarming proportions as the untreated water could even pollute the underground water. While the MC took action, the Forest Department and the Punjab Pollution Control Board continued to turn a blind eye to the problem. The Ludhiana-Jalandhar road is not the only place where the forest cover is under threat. Even on the Ferozepore road some industrial units are throwing effluents on the forest area. On the Khanna highway also the trees are meeting the same fate. The matter has already been highlighted a number of times but the Forest Department continues not to bother about the problem. The district court police post in Ludhiana.—Photo: I.V. The city police now holds the dubious distinction of housing two police posts which function from tents only. While the Ghumar Mandi police post is working from the makeshift arrangement for over a year now, the newly created district court police post is also functioning from two tents in the absence of any proper building. While residents want security and so does the government officials and the legal fraternity at the mini-secretariat complex, no one has offered any land or assistance to the police for housing the posts in proper buildings. The Ghumar Mandi police post that caters to the need of one of the busiest markets and residential areas of the city is functioning from a tent near the Aarti chowk. Of all 23 police posts in the city, this is the only one that has been duly sanctioned by the government, while the other posts are functioning on a need basis. Despite its better status than others, it has no roof or walls. All efforts of the police to find even a two-room accommodation for running the post have failed as no person or organisation is willing to take the “risk” of leasing out a place to the police. The post presents quite an embarrassing picture for the cops. Sources in the police post said during rain the cops had to run to a safe place along with their files and documents. The cops cannot construct a proper building here. The land was in the green belt area. The post earlier functioned from the Division No. 5 police station building near the Jagraon bridge. But the location was always objected to by Ghumar Mandi shopkeepers and residents who complained they had to travel all the way to Jagraon bridge for taking police help. The district court police post was created recently due to increasing armed assaults in the complex. 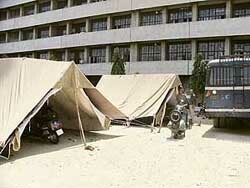 However, it is going the Ghumar Mandi police post way as it is also housed in tents. The sources said they feel like working as gatekeepers instead of police officials. SSP R.K. Jaiswal said he was apprised of the problem but in the absence of any help from residents and non-availability of government land or building, the police has no option but to work from the tents. He said the matter of the Ghumar mandi police post had been taken up with the municipal corporation and some solution would be found. “For the district court, we are requesting the deputy commissioner to provide us two rooms for the post. We have sent the proposal,” he added. With the high court fixing the next date of hearing in the first week of July in the delimitation case, the elections to the municipal corporation are all set to be delayed. The case, challenging the delimitation of wards for the elections, would come up for hearing on July 3. Sources in the local bodies department said the department would not go to poll during the trial of the case. They said the elections would be postponed in all possibility as even if the high court gives its decision in the favour of the MC it would be after a month. And if the decision was in the favour of the petitioners, then it would take more than a month as the department would require a lot of time to prepare the maps a fresh, then invite objections and then notify the development. The fixing of date sent a wave of jubilation among the Congress camp in the city today as they claimed that the postponing of elections would turn the mandate in their favour due to Akali-BJP government’s failure to fulfil the atta-dal promise. “We are sure that the government would never be able to provide atta and dal to the poor on cheaper rates. Their next deadline would also expire and the people would come to know about their reality and vote for us,” claimed Jagmohan Sharma, DCC chief. He added that they wanted the review of delimitation process, so some councillors had challenged the earlier process in the high court. The delimitation of wards was challenged by Congress and Akali councillors. Union finance minister P. Chidambram is understood to have directed the Central Board of Direct Taxes (CBDT) to reconsider the replacement of new income tax returns formats with the previous “Saral” forms and come out with simpler formats, if possible. The CBDT had recently introduced eight new formats of income tax return (ITR) forms for different categories of assesses, which were considered to be complicated as compared to the Saral form. Even the tax professionals were of the view that the new formats were cumbersome, time-consuming, and required such details of financial transactions that were not necessary for average assessees. According to Punjab Tax Bar Association chairman Ashok Juneja, who is also the vice-president of Chamber of Commercial and Industrial Undertakings, scores of representative bodies of trade and industry had prevailed upon the BJP member of Lok Sabha Avinash Rai Khanna to raise this issue before the finance minister so that these new ITR formats could be replaced with a simpler one. Juneja said the union finance minister, in a written reply to Khanna, had stated that the matter had been referred to officials concerned of the ministry with the directions to look into the demand for a simpler format and take appropriate action. Chidambram had further assured of a reversal as and when the issue was examined and a report was received from the CBDT. Making a strong case for retaining a simple ITR format for the convenience of assessees and the tax professionals, Juneja suggested that if at all the CBDT wanted to retain the new ITR forms, these should be made applicable to those assessees having an annual income of more than Rs 5 lakh, at least for the time being and the small tax payers be allowed to file returns on “Saral” forms. He was of the opinion that the government ought to give more time to the tax payers and the professionals to study and understand the new formats before these were made compulsory. “To start with, the CBDT will do well to make it optional for the assesses to file their returns either on old Saral form or recently introduced new forms till simpler ITR formats are in place,” Juneja added. Residents of this nondescript village have urged the higher authorities and human rights organisations to conduct a survey in the border areas of the state where a substantial number of helpless youth have been “captivated” by farmers as no labourers were ready to work willingly in their fields. The demand was raised after a group of villagers led by Jathedar Harpal Singh Jalha succeeded in getting one such youth released from the clutches of a farmer of Abdal Tarkhana village in the Dera Baba Nanak area and he (the victim) made this startling disclosure. The youth had been virtually held in chains for more than a year. In a communication addressed to higher authorities, including Chief Minister Parkash Singh Badal and the chairman, Punjab Human Rights Commission, the Jathedar, who is also a former sarpanch of the village urged the authorities to conduct a survey of the border belt where a substantial number of Punjabi and migrant labourers might be living under inhuman conditions. According to him, Jassi had disappeared under mysterious circumstances from Sahnewal about 15 months ago. In fact, Jassi had been abducted to Abdal Tarkhanna village where a farmer later identified as Balwinder Singh Billa kept him as bonded labourer. Jassi alleged that the farmer and other members of his family, including female members, used to thrash him. Rich tributes were paid to shaheed Avtar Singh, a Kargil martyr of Shamashpur Singhan village, near here, on his sixth death anniversary. Inder Iqbal Singh Atwal, former MLA, Koom Kalan, while addressing shaheedi samagam, said it was indeed shameful that respect for martyrs’ families was decreasing day by day. He said while martyrs had sacrificed their lives for the nation, it was our duty to look after their families. Atwal assured the villagers that grant would be given to complete the proposed park in the name of martyr Avtar Singh. Gurbakh Singh, father of martyr, was honoured with a siropa on the occasion. Atwal presented a cheque for Rs 80,000 to the village panchayat for development works. Col Jarnailsingh Jalajan (retd) said there should be a law so that benefits of martyrs can be equally divided to the parents and wife of the martyrs. Atwal assured all-poosible help for the development of the area. Playing popular music in public may prove to be a costlier affair if there is no prior permission taken for it from the authorities concerned. The violators can be penalised under the provisions of the Copyright Act and the punishment can go up to Rs 2 lakh and or three year imprisonment. Three establishments - Haveli, Jalandhar, Hotel Marriot, Ludhiana, and Nagpal Regency, Ludhiana, - have been forbidden from playing music in their premises without the licence by the Delhi High Court. According to Sidarth Arya, a copyright expert, the awareness among people in the country is still low. He says under the Act the music that is played in the public like in the hotels and the banquets needs to be licenced by the Indian Performing Rights Society Limited (IRPS), which is registered with the copyright department of the union ministry of human resources development. It is a nodal agency for all the artistes in the country and it is responsible for forwarding them the royalties earned from different establishments. Ironically, Arya says the royalties earned by the Indian artistes from England are about three times more than they earn in India. This is simply for the reason that the Indians usually do not pay the royalties although the royalty tariff is lowest in the world. The city police today claimed to have busted a racket of ‘stock witnesses’, who were using fake documents, farad and other registration documents for standing as a guarantee in bail bonds. Tarlochan Singh was arrested in this connection. Accused Tarlochan Singh used to pose as a Sarpanch and allegedly stood as a witness also. While he claimed that there were nearly 40 such stock witnesses operating in the district courts, police sources said the number was easily more than 100. SP (Detective) said the man was caught red-handed after a naib court suspected his true credentials when he was deposing in favour of an accused in a criminal case. The police has booked him on charges of cheating and forgery. Police sources said the stock witnesses like Tarlochan were a major headache in the criminal justice system. They furnished documents on the basis of which an accused was released on bail. However, when the accused jumped bail, the police and the court found it hard to trace him. The stock witnesses always gave wrong addresses and the fake documents also did not lead the police anywhere. SP (Detective) said the police was proposing that all original bail documents should be stamped so they were not used again and again for bail purposes. Enmity between rival gangs of pickpockets allegedly led to the gruesome murder of one of them on the intervening night of May 31 and June 1. The victim was first beaten up, then stoned to death and later set on fire to hide his identity. SP (Detective) Gurpreet Singh said a gang of pickpockets, including three brothers, had allegedly murdered Balwinder Singh, while one of their nephews and a three-wheeler driver had helped them in disposing the body by setting it on fire at a vacant plot on the Ludhiana-Jalandhar highway. He said all the accused were drug addicts and committed crime primarily to buy money for narcotics. The three brothers were Parshotam Singh, Harjinder Singh and Baldev Singh. Their nephew is Kulwinder Singh and a three-wheeler driver Soma. All, excluding Baldev Singh, have been arrested. The SP said CIA in charge Jaswinder Singh Mangat and SI Balwinder Singh, in charge special operation group, had solved the case. During questioning, the accused confessed to the murder. They reportedly told the police that they were taking drinks at a restaurant where the victim and his gang also reached and sat separately. They, however, soon had an argument and exchanged blows. The victim’s gang members ran away after being outnumbered. The accused then caught the victim and beat him up. They stoned him to death in a vacant plot. Police officials said the accused then allegedly took the help of their nephew and the three-wheeler driver to burn the body. The SP said though the identity of the victim had been established, the police had initiated the process for the DNA examination to scientifically prove his identity. Coca Cola launched a ‘Minute maid pulpy orange juice’ here today. Addressing a press conference Vikas Chawla, vice-president and franchise operation head of the company, said the product would be retailed across 20,000 outlets in Punjab, Haryana and Himachal Pradesh. The product targets youngsters and it would further help the company to extend its market. He said the company has planned a 360 degree marketing communication plan which involves organising road shows, including extensive experiential sampling sessions in markets, offices, malls and colleges, backed by contests. City residents have termed the Telecom Regulatory Authority of India’s (TRAI) direction pertaining to unsolicited calls as a welcome move. Unsolicited commercial calls and text messages would attract a penalty of Rs 500 per call, the regulatory authority has directed. “Despite court regulations such calls had become a headache. Telemarketers did not bother about the time when they called. It was common to get calls even on holidays, Sundays. Not only was it a big time waste, it wasted energy and even if one clarified that one was not interested in their services, a single company would continue calling several times. The new regulation is a big relief,” said Varinder Kapoor, general secretary, United Cycle and Parts Manufacturers Association. While most of such calls came from financial institutions for selling products like loans, credit cards, insurance policies etc, recipient of the calls had no option but to listen to details furnished by the caller. “One understands such calls do generate high revenues to these companies but that should not cause people any inconvenience. It became particularly irksome when one would be in an important meeting or busy in one’s work and would have to take such calls. Besides, if one was on roaming, it would even cost to take such call,” said Madhukar Kumar, a resident. With financial institutions engaging in high publicity of their products, residents said most of the times such calls were not needed at all. Residents said they were now waiting to get registered in the Do Not Call registry (DNCR) so that their name was included in the list and they were not disturbed by such marketers. Telemarketers, however, said the regulation would put a dent in business and also cost employment to many. “Telemarketing has been a major employment generator in recent times. With this kind of direction, employment would suffer and so would business,” said Maninder Singh, an executive. It is economy, not regulations, that is acting as a driving force for the industry to avail membership of the common effluent treatment plant. After a mild response, industrial units not only from electroplating industry but also from wire drawing and bar drawing are coming forward to avail the membership. Ten units from wire drawing and bar drawing units and nine more from electroplating industry have availed the membership within three days of the plant being put to operation, raising the total count to 185. Leading industrial units in the city too have expressed keenness to avail the membership. The executive committee of the Ludhiana Effluent Treatment Society says it is targeting the number to be increased to 500 within a fortnight. “The treatment plant at Focal Point is now operational and more units are signing MoUs. Cost is acting as a driving factor and units from industries other than electroplating too are evincing keen interest,” said Joginder Kumar, chairperson of the society. Apart from the membership fee, an industrial unit that avails membership is required to pay 70 paise per litre for treatment of its water. With an average of 200 litres of water that is treated every day, the estimated cost for 25 days is Rs 3,500. Besides, a timely payment would also fetch discount. This is much higher in comparison to what the units have to pay when they install and run their own treatment plants. A large number of industrial units are throwing untreated water in sewerage despite having their own treatment plants. While a higher membership, if it happens, would smoothen functioning of the plant, industry is still opposed to the P. Ram Committees regulation pertaining to obtaining a no objection certificate from the committee in case of expansion. Industry representatives feel this would hamper industrial growth in the state. “The move is un necessary particularly when there are designated areas. With this regulation industrial units would be hesitant to go in for expansion,” said an industrialist from electroplating industry.